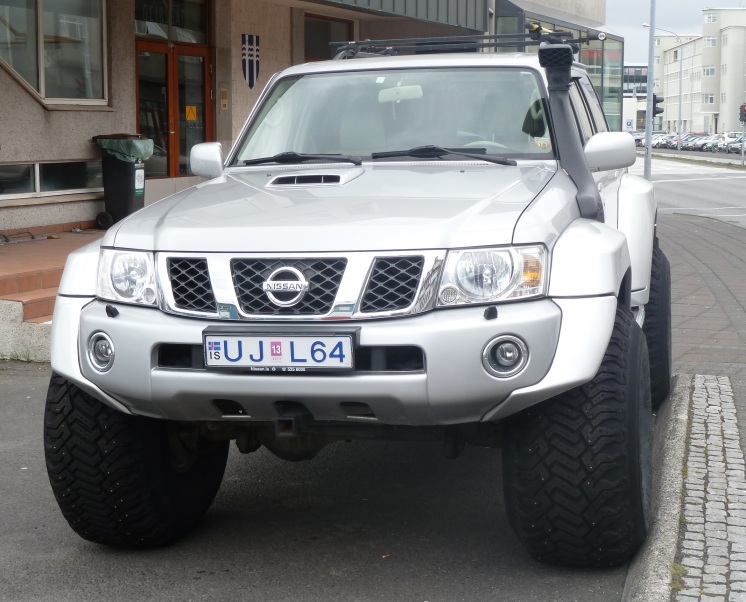 I mentioned in an earlier post that 4x4's were pretty common in Iceland, but that wasn't the whole story. 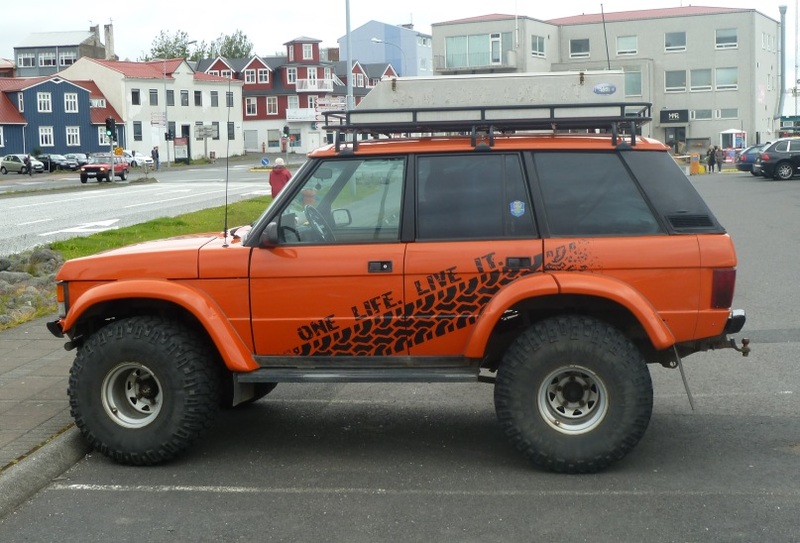 Not only are 4x4;s popular but fitting extreme wheels and tyres seemed to be the norm. Given that it was summer time presumably these are for getting off road where the surface is soft, maybe the lava fields or can you drive on a glacier? 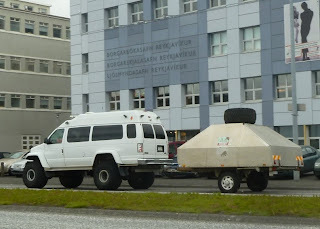 And what about this one, it was one of the tour companies that go up into the interior. 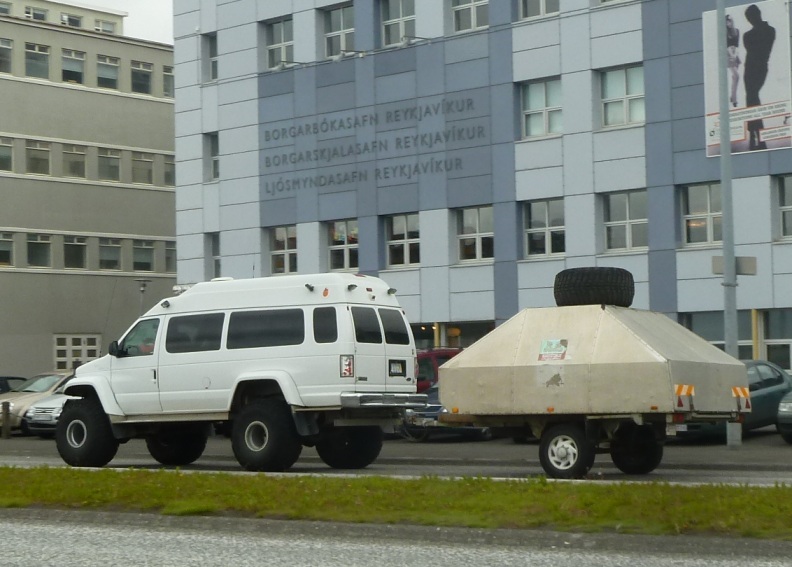 I guess the trailer was for camping equipment or maybe it just had to be that big to carry the spare tyre. 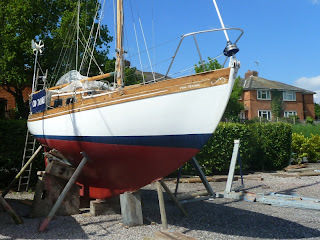 Vertue number 111 on the hard at the Berthon yard in Lymington, built by Kimber & Blake of Bridgewater in 1962 and looking splendid, I especially like the varnished sheer plank which really sets off the design. 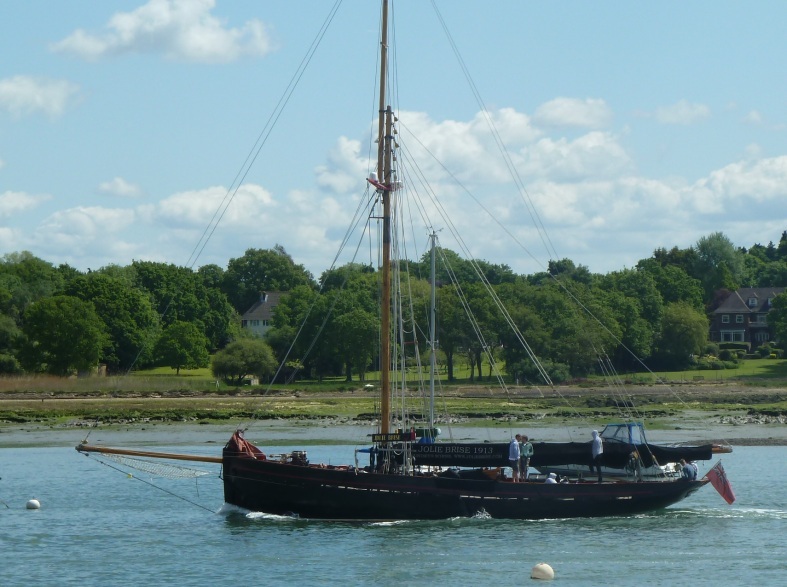 Designed by Laurence Giles the Vertue was made famous by some intrepid voyages in the early days of offshore and transatlantic sailing. 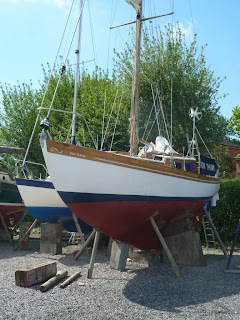 I need to practice my photography, it's really often very difficult getting good pictures of boats ashore or indeed in marinas which do them justice. 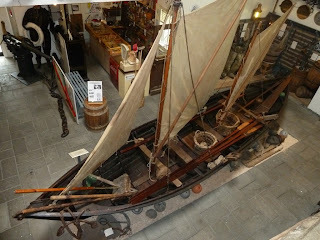 Inside there was a local sailing whale boat, difficult to photograph in the cramped space, spritsail rigged and clinker built with almost delicate planking pointing back no doubt to the Viking heritage. 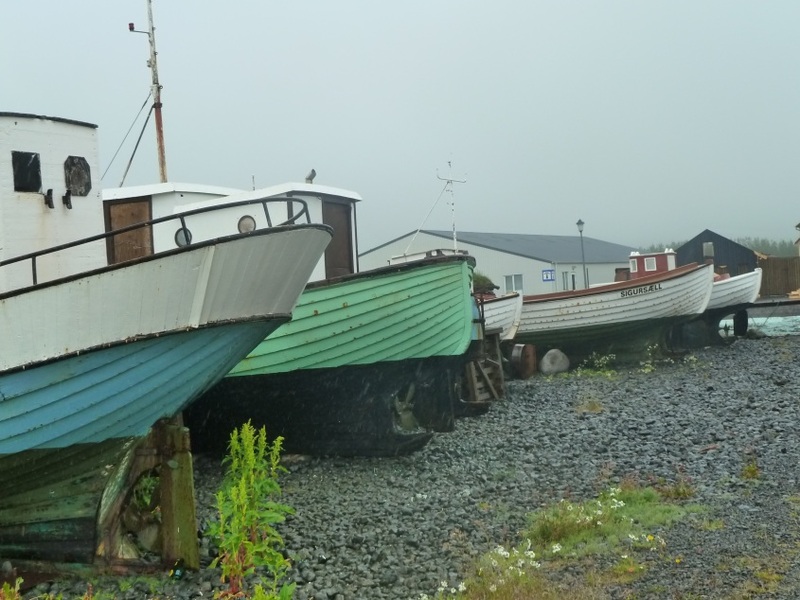 The area had formerly been an important fishing centre, together with evidence of associated shipbuilding. 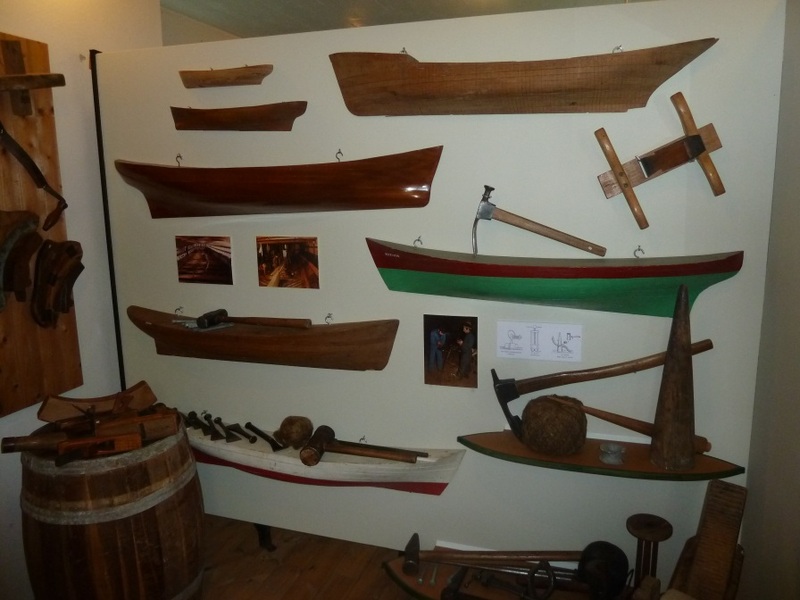 There were also some delightful models of 20th century fishing craft. 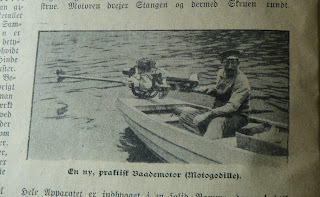 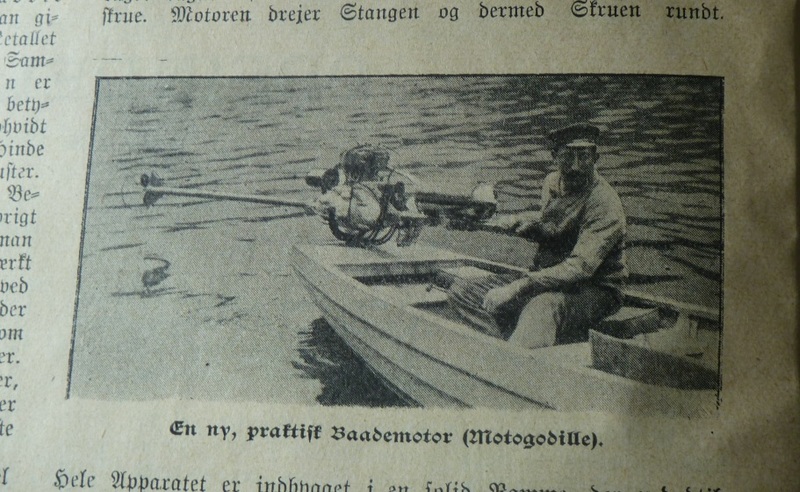 This was a spectacular find in a 1910 copy of the "Tillaeg Til" Illustrated Family Journal an early outboard, actually I like the local name - baadmotor. 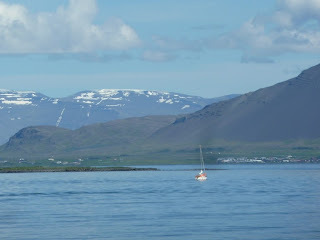 Iceland is spectacular, a north Atlantic island, with fjords, mountains, lakes, waterfalls and more mountains, but strangely enough we hardly saw any sailing. 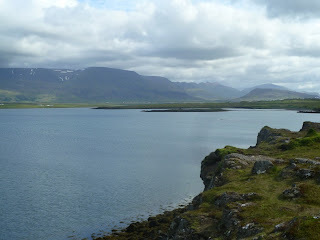 This is the fjord outside our house, 15 minutes drive from down town Reykjavik. 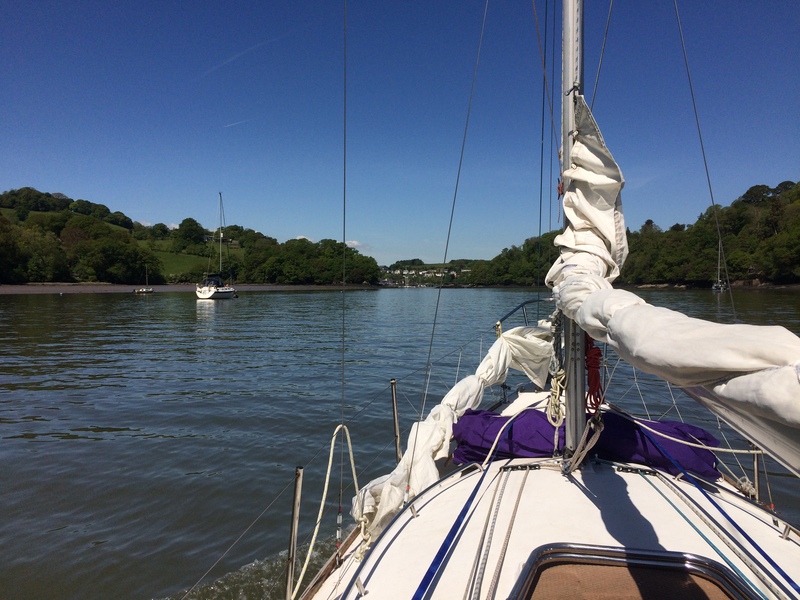 With 24 hours of daylight there's plenty of time for a sail after work, but we didn't see a dinghy or sailing club the whole time we were there. 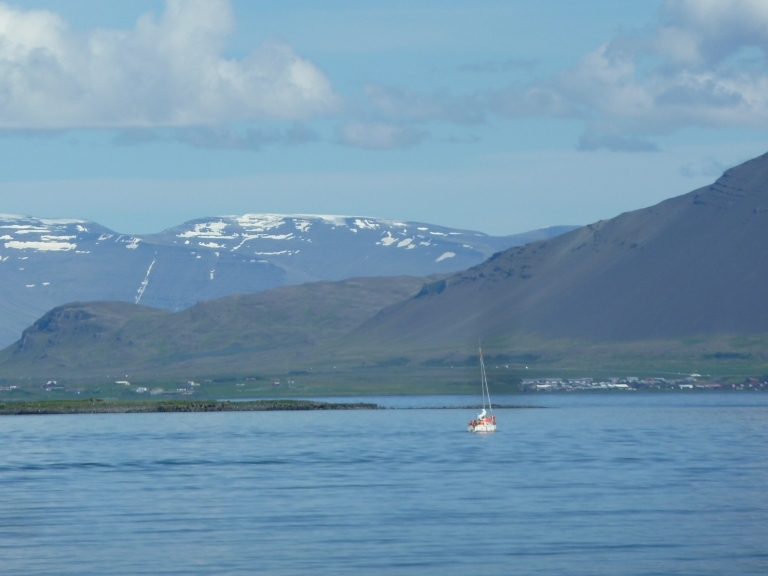 Now I can imagine the short summer season and the rather cold water might be a little off putting if you were sailing a Laser (Kyndill in Icelandic) or a Sunfish. 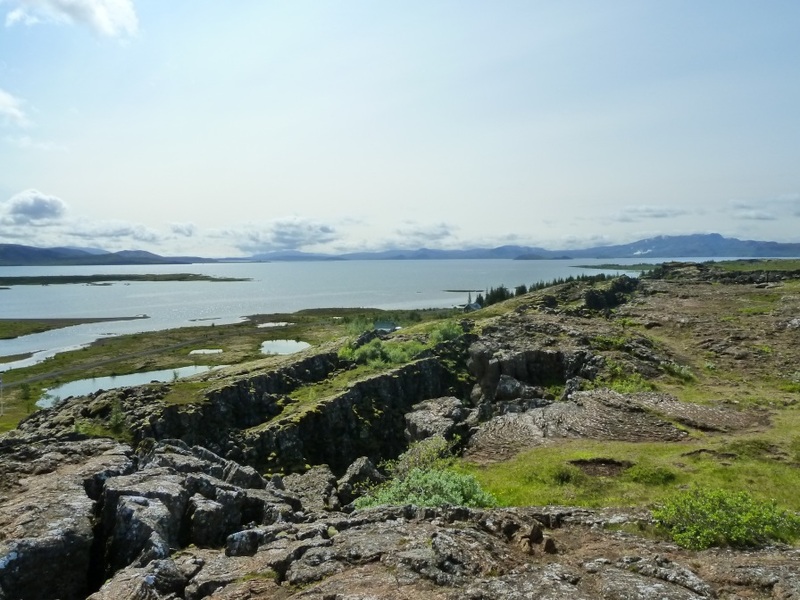 Equally sailing along the exposed coast could be challenging and often dangerous with the changeable weather, but imagine camp cruising a sturdy and comfortable dinghy across the lake in Pingvellir Nation park (below) absolute heaven. 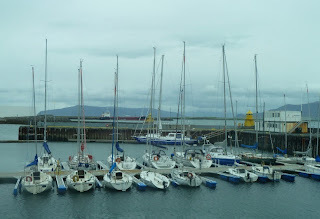 It seemed so strange, the Icelanders are generally an outdoor bunch, trailer tents and off road SUV's are almost ubiquitous but for some reason sailing doesn't seem to be popular. 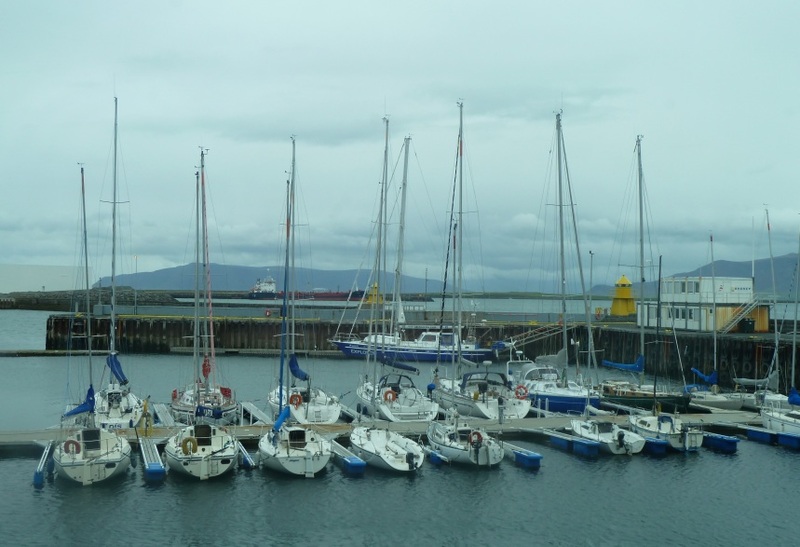 Of course we did drop by the main marina in Reykjavik, can you imagine a Solent marina this empty in July? 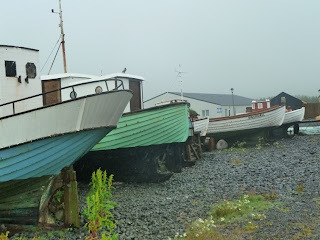 Finally we caught up with some traditional boats at the open air museum in Akranes, a fishing port about an hour from Reykjavik. 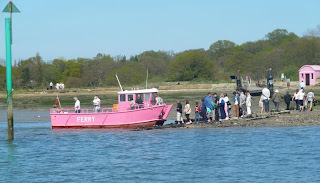 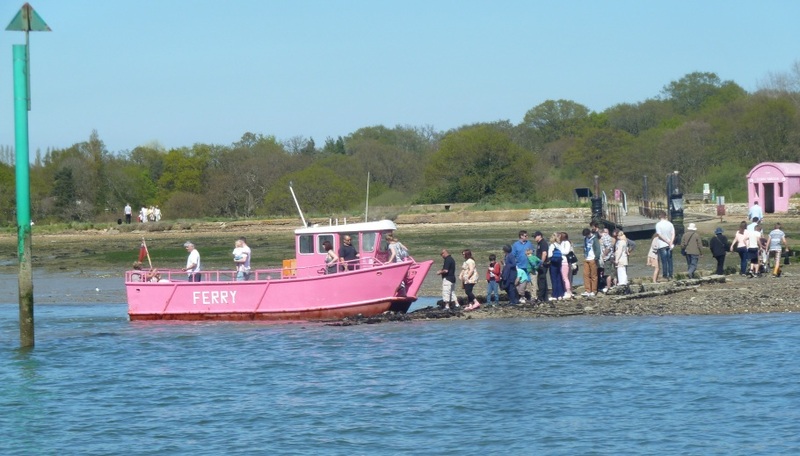 It wasn't an especially bit tide, but at low water the pick ferry couldn't get anywhere near the jetty over at Warsash. 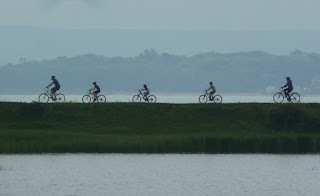 I guess there were a few muddy shoes, but hey the sun was shinning, it's great to be out on the river. No, not some philosophical introspective, just a response to the many recent "where am I" posts from several fellow bloggers. Admittedly not a place that immediately comes to mind for a summer holiday destination, but if like us you enjoy the great outdoors then definitely worth a visit. 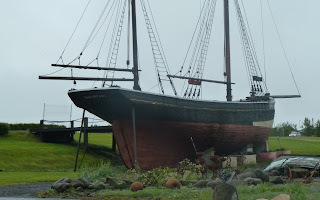 At 66 degrees north and a week after the summer solstice the days are long, really long, about 2 hours of twilight was as dark as it got. If you still haven't worked it out here's a really strong clue and yes the water really is that colour and around 32 degrees C (98 -102 F), so you can bathe whatever the weather. 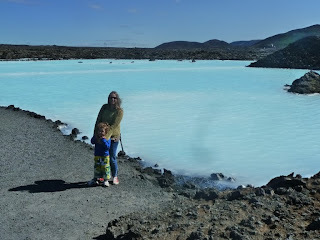 It's a geothermal spa formed in old lava pools, unlike a swimming pool the bottom is a bit lumpy, like the admission fee, still Mrs BB really wanted to go and she was right it's an amazing place. I can't decide if this in an ignominious end to a fine old boat or one that at least maintains the design and craftsmanship of what was a fine boat for a few more years. 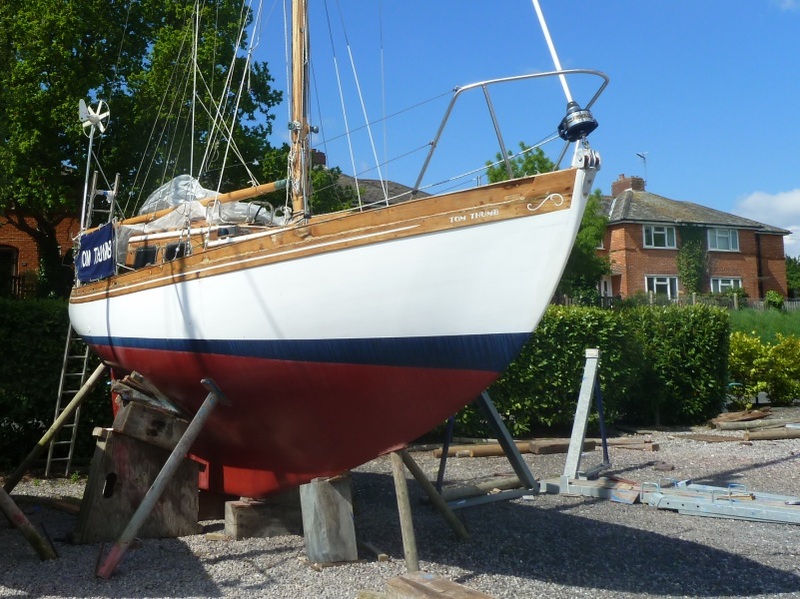 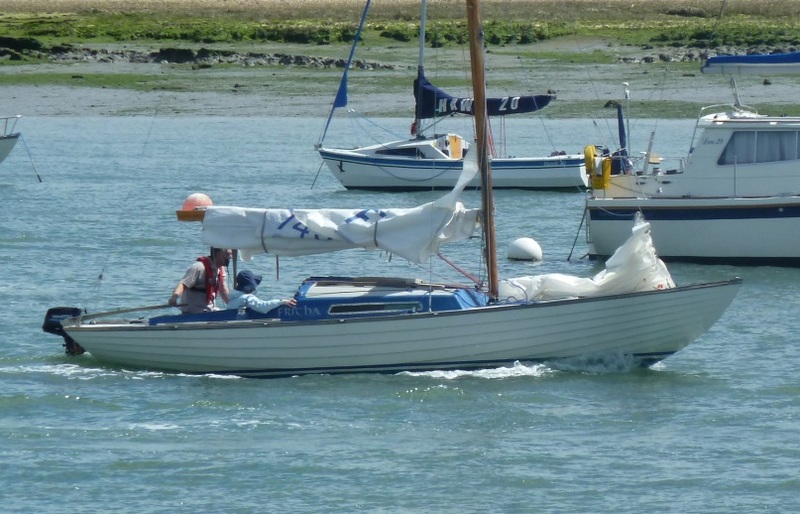 The lines accentuated by the clinker (lapstrake) planking shows a fine bows running out to full bilges at the mid section. 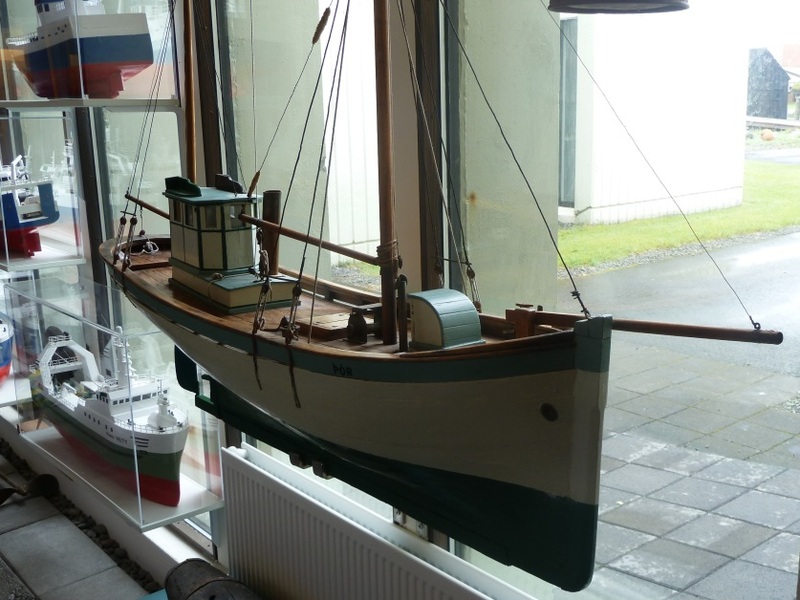 As a working boat she would have been efficient to row or sail with good load carrying capacity. 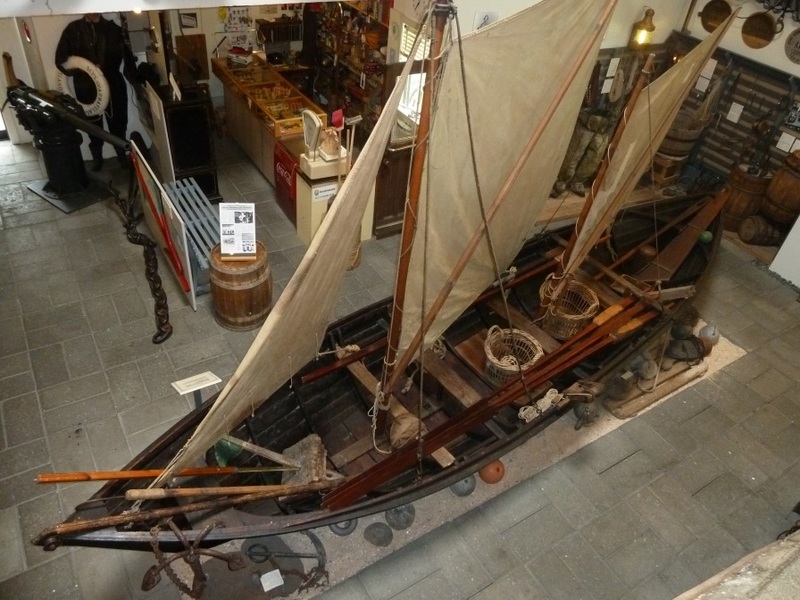 Personally I can take or leave a double ender, give me a well proportioned transom like this one any day, note also the horse type traveller across the stern. Located in East Cowes if anyone knows more about her history please drop me an email. 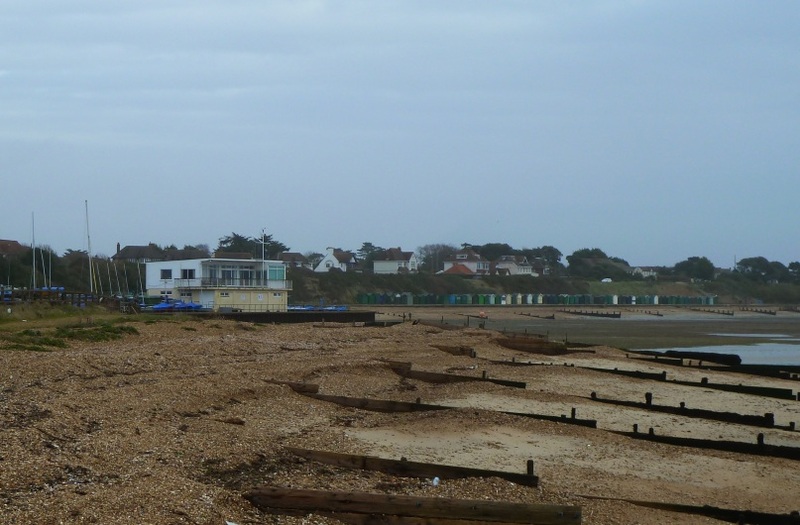 The club house is in a great location between the small harbour and the shingle beach beneath what I guess are Osborne cliffs. 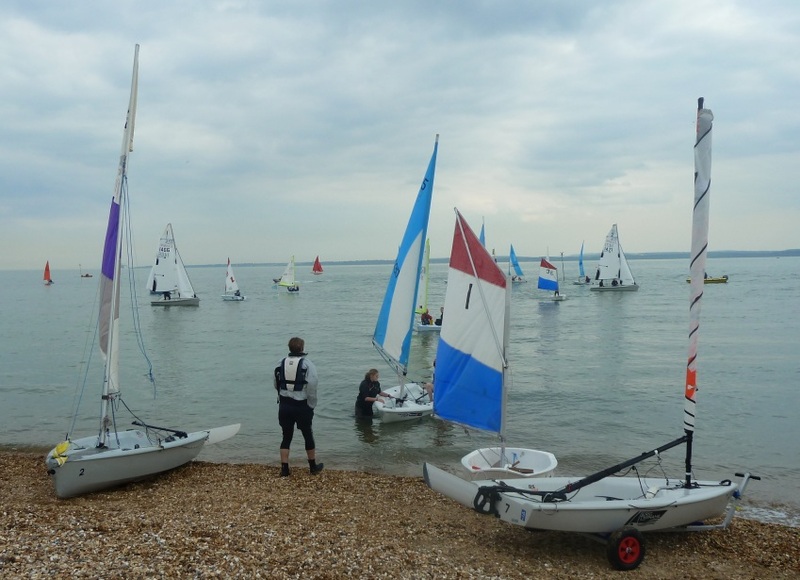 The club has a really good range of boats available to members including Optimists, Toppers, Laser Picos, Laser 2000, Mirror, RS Fevas, RS Teras, Wayfarer and RS Visions and even a Kayak. 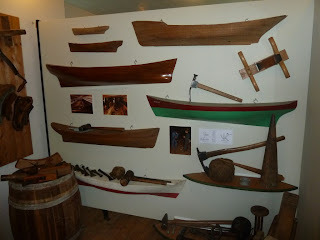 Many of which were available for visitors to "have a go"
I got into a long conversation with the Commodore Bob McManus who was very welcoming as were all the folk we met there. 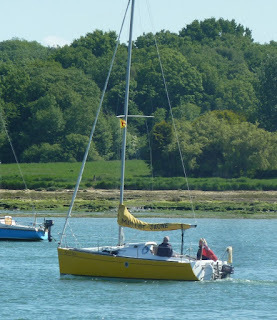 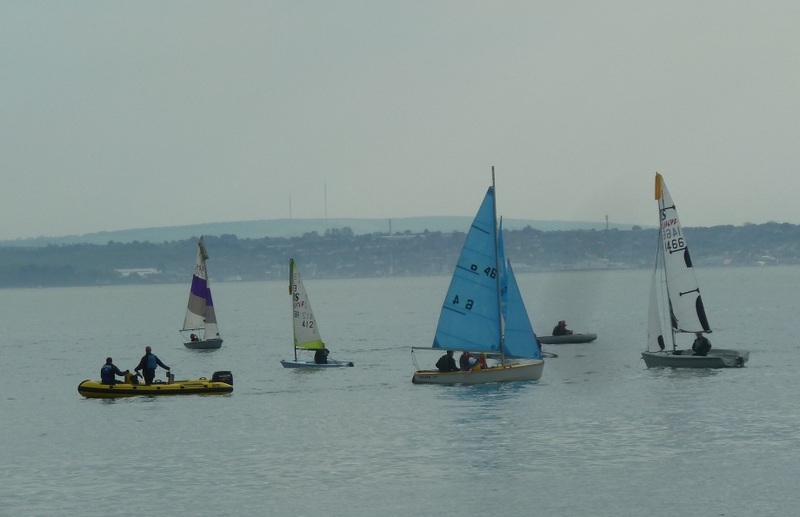 The club has a very active RYA training group and despite the tidal access a really busy sailing schedule. 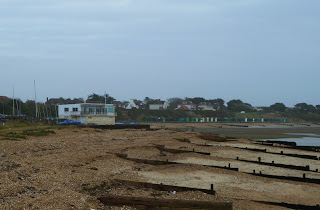 Above looking very different when this photo was taken back in the cold grey days of April, the club house stands at the entrance to Hill Head haven. We want to find a club where Joseph can learn to sail with kids of his own age and most importantly without mum and dad. 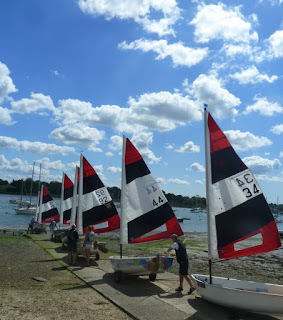 Equally it needs to be a nice family club where Erica and I can spend time when he's out on the water or hanging out with his friends. 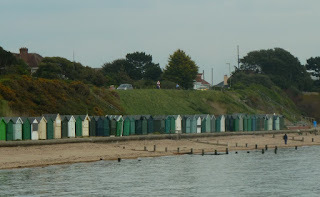 Hill Head is definitely on our short list. 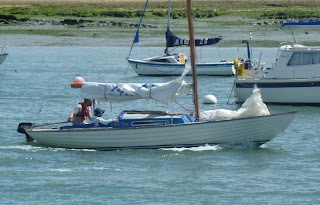 What better way to spend a sunny, Sunday morning that breakfast with friends at the cafe on foreshore and watching a steady stream of interesting boats go past. 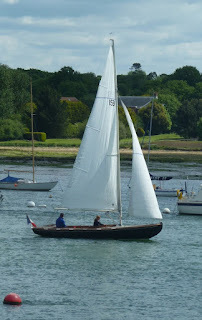 A few weeks ago it was a good weekend for such indulgence with boats returning from the Around the Island race and many traditional boats returning from YOGAF. 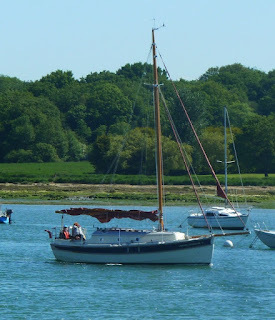 Above a very modern gaffer a Cornish Crabber 26 while below Jolie Bris the famous Le Harve pilot cutter built in 1913 in her centenary year. 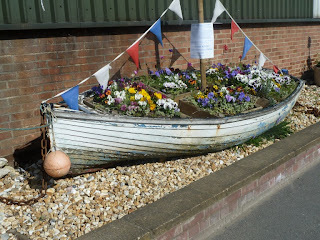 Who couldn't admire the Nordic Folkboat, this example was making fantastic spped over ground on the strong ebb tide. At first glance very similar to the native X Boat, this looks like a Tofinou built by Latitude 46 in GRP to a 1928 design from the Ile de Re. 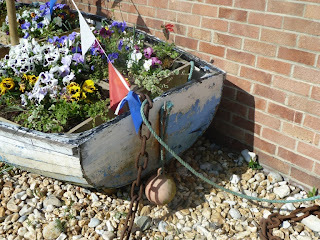 Fascinating project Collective Spirit part boat part artwork the boat was built using wooden objects donated by people along the south coast to not only create a yacht, but seaworthy archive of stories and memories. 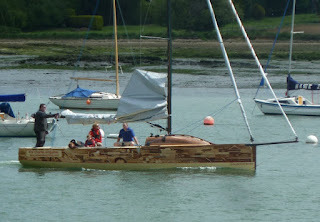 If you look closely at the hull you can see a tennis racket, walking stick and a coat hanger making up the hull construction. 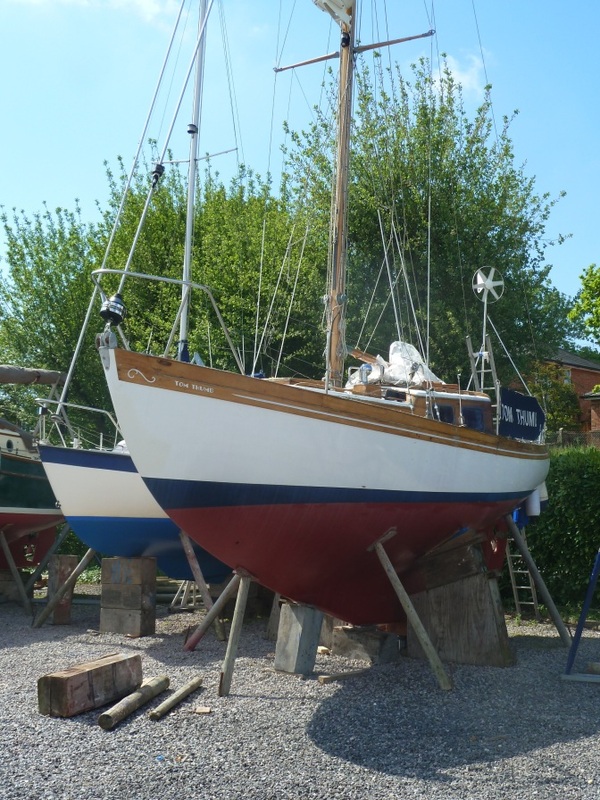 There were more than a few modern boats, another First 210 recently arrived on the river. It was a busy day on the slip way for the Foxer fleet, mind you the cafe had quietened down once the fleet had launched so no queuing when I went to get a second cup of tea.